When creating a new blob triggered Azure Function, the default type binding is Stream. CloudPageBlob, etc. Both of these classes are derived from CloudBlob, yet it cannot be used as a binding type. Although the compiler doesn’t mind, CloudBlob will at run-time during function indexing. When the functions host indexes all the functions available, it fails if the binding type is CloudBlob. If you know that the triggering blob will be a block or page blob, you can use CloudBlockBlob or CloudPageBlob, respectively. For code that may be triggered by either, use ICloudBlob instead of CloudBlob. 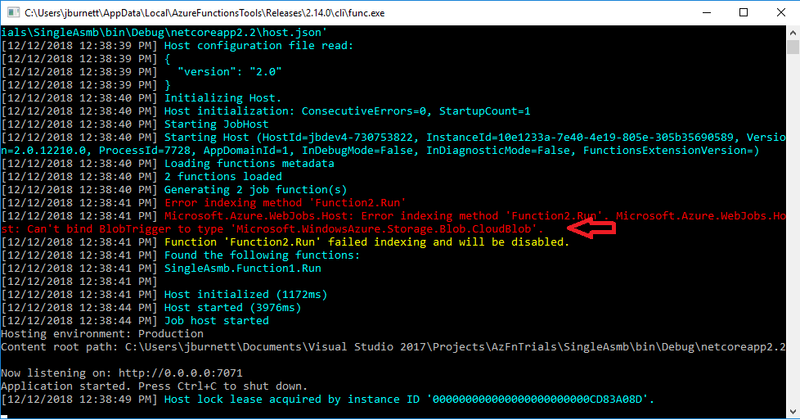 Note that the error message is helpful in v2 of Azure Functions. For the full list of types available for the triggering blob, see Microsoft’s documentation.